A small and cute book about a young boy's questions. 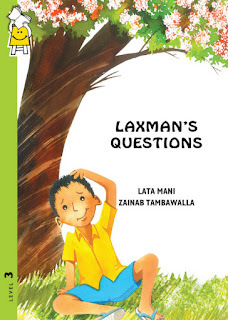 Laxman has questions. For birds and trees. About animals and nature. He wonders. And he learns that questions are as important as answers. His grandmother is always encouraging, while his mother is secretly proud of her son's inquisitiveness. 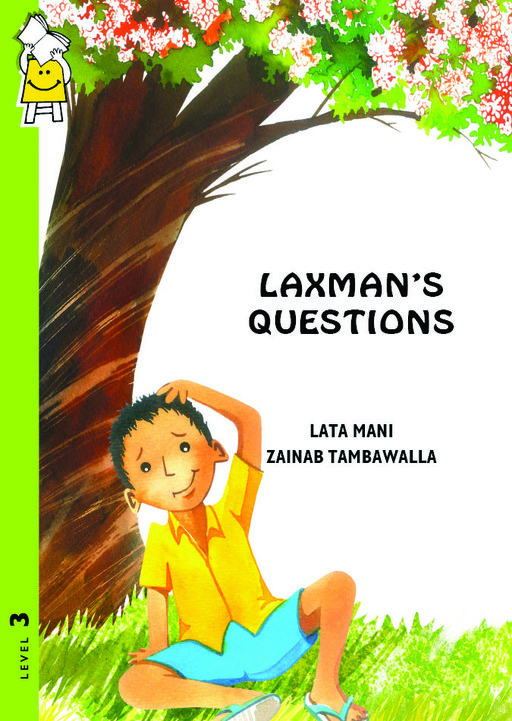 Laxman’s head was full of questions: Why did seeing a bird fly make him happy? Did the birds who saw him feel just as happy? Read this book to see if you have such questions too. As part of Pratham Book's initiative to have volunteers conduct reading sessions, I contacted Maya and offered to conduct a reading, or two. She agreed, and a few days later I had the book in my hands. A few days later I was able to conduct a reading at http://www.magicpuddles.com/, an amazing school for pre-schoolers, run by Ravi and Viji. There were about twenty toddlers in the room - Magic Puddles follows somewhat of a Montessori model, where children different ages are mixed together to provide for a more enrichening learning experience. Having children between two-and-a-half and four-five years of age meant reading out the story page-by-page would be a challenge. What I instead decided to follow was to not read out the story, but rather use the rich, full-page and double-paged color spreads to tell the story. Holding up the book, spread open, and then asking the children to guess what was happening turned out to be a winning strategy, and injecting humour in-between kept the kids' attention. One thing that I realized was that the kids were too young to quite understand the importance of speaking to plants and animals, in a metaphorical sense. They understood the importance of asking questions. And were very willing to demonstrate it in practice too! I shot this too soon... the little fella had not yet finished putting the book up. And now he has. And now seeing the photos again, I sure hope the little angel in the brown t-shirt got his turn, because in the photo below, he is looking very hopefully, but still without the book in his hands. And did I tell you the book is priced at Rs 30!! I think all of Pratham Books' books are priced at below Rs 50 - that is simply amazing!